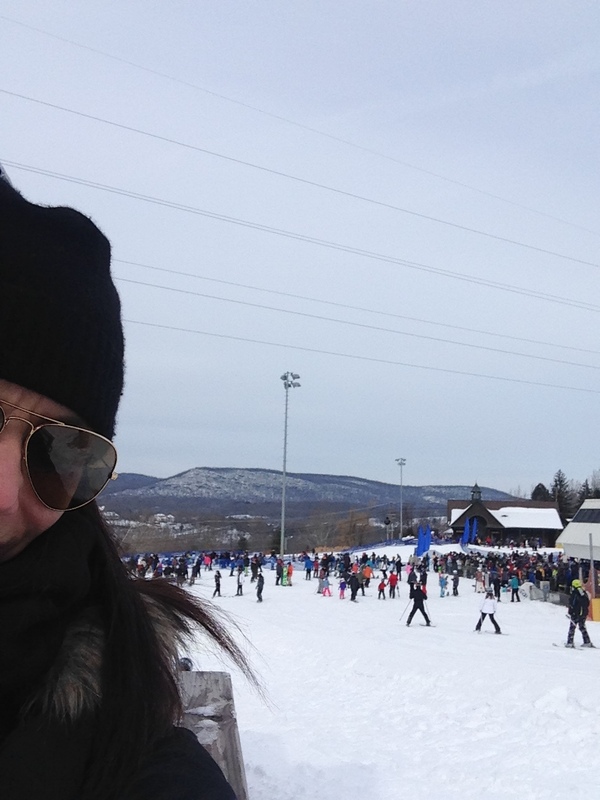 We spent part of a recent weekend “getting out and playing” at Mountain Creek and Crystal Springs Resort in very-close-by Vernon, New Jersey. 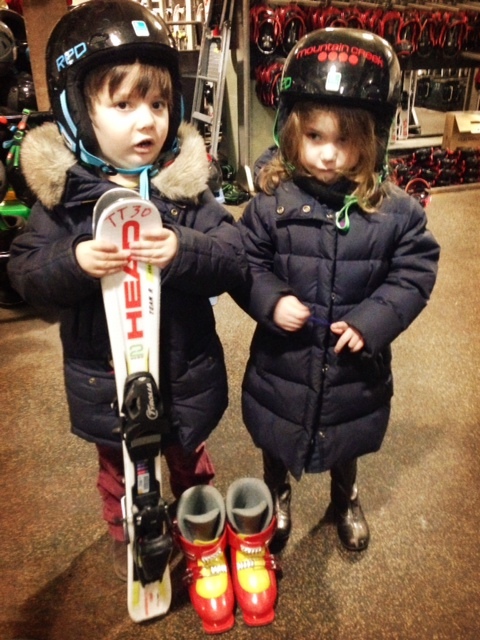 This was the first time the kids and I had gone skiing, and, other than the unfortunate incident of my forgetting at home the bag in which ALL the kids’ winter and snow clothes were packed, we had a fabulous time! The drive with traffic from New York City was about two hours (don’t leave on a Saturday mid-morning when the rest of the city is also going skiing). Realizing that we arrived with no warm clothes for the kids, our kind hosts helped me shop for items in the lodge’s ski shop–and I did wind up with some great ski clothes the kids will be wearing for several years (oh, they better be wearing these things for several years!). I had never wanted to go skiing before, largely because of all the gear required to do so. And I was not wrong about this. The Bradfords’ lack of preparedness added a good 40 minutes onto the task at hand, but outfitting three children with many pounds of helmets, skis, and boots lived up to expectations. The staff at the mountain is, however, outstanding; they helped us size correctly, fasten safely, and carry our skis without causing serious injury to other guests. They also did not laugh at us. Our stellar ski instructor, Allie, was so delightful and patient that I offered her a job as our live-in nanny (she declined). I had never been on skis before–and I am completely in love with this sport now. (As long as this sport does not involve swinging high in the sky on a wire chair. The bunny trails will be a-okay with me for a long while.) We had such a great time learning to ski (I mean, to not fall). Ellie also loved the lesson; Henry lay down at the foot of some snow boarders; and Molly wanted lunch. My husband, an excellent skier, will have to wait for another opportunity to strut his mountain stuff as he spent the afternoon picking up various Bradfords from the snow and untangling skis. 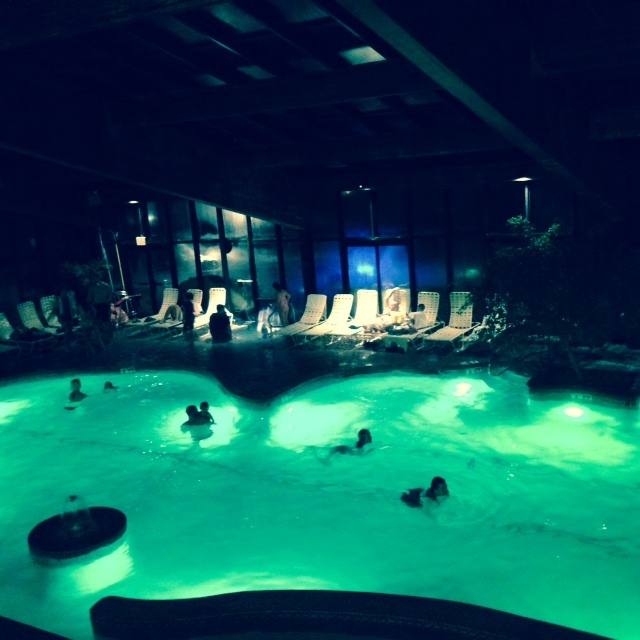 The kids favorite part of this trip quickly became the pools at the beautiful Minerals Resort and Spa. The gift shop had bathing suits (which were also forgotten in the bag at home), and we spent all evening shriveling up in the enormous indoor family pool and the kiddie pool (which is literally attached to the relaxing, steaming, hot tub–they are separated by a low wall. I can see you from here, kids!). There is, as well, a small bar in the pool area that we felt obligated, for the sake of this review, to sample. There are great family restaurants, including Kites, where we had breakfast before taking the convenient shuttle outside the hotel lobby door back to the mountain on Sunday. 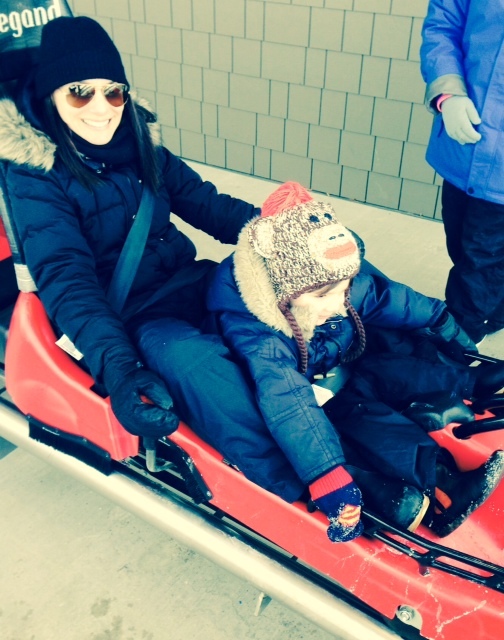 Because the kids were too young (and short) to go snow tubing, and too tired to go snow boarding (next time, husband), we visited the Mountain Coaster–a small roller coaster that provides a fast, exhilarating seven-minute ride around a raised track. The kids LOVED this. I know because we went on 25 times with each kid. Mountain Creek is a wonderful, local place for a family vacation in the winter–and they have activities planned for all year around, including golf and a water park. We will be bringing the kids back–with their luggage; and I am planning a girls’ weekend at one of the hotels, so we can enjoy the world class spa services, fitness facilities, and wine cellar. I was compensated for this review with accommodations at the hotel, gear rental and lesson on the mountain, and Mountain Coaster tickets. All opinions, as always, are mine. This entry was posted in Event, Family Life, giveaway, New York City Living and Coping, Parenting Moments, Review, sponsored, Travel and tagged family ski vacations, Minerals resort and spa, Mountain Creek, new jersey winter, ski vacations, skiing, skiing close to New York City, skiing with kids. Bookmark the permalink. The kids look great in their new gear. Looks like lots of additions at Mountain Creek since we were there. Love this, Wendy. This is great info because I used to be a ski instructor and I would love to have my kids learn skiing as young as possible and enjoy it as much as I do. Seems like a great spot, near NYC and probably far more affordable than fancier, much further places. I was thinking of taking my kids to my brother’s ski house near Quebec City, but this NJ place is much more convenient and -I am certain- much less cold. I love the pool idea too. Thanks for the info and let me know if you want to ski with us at some point. Our fav part of winter vacations is that we’re not home to shovel the snow! We’re out playing in it! My 3 kids and I love making hot chocolate and watching the snow fall. 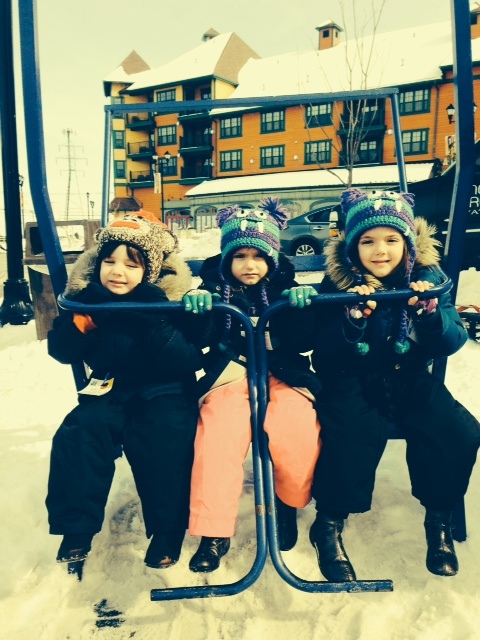 Love playing in the snow and watching my kids explore the outdoors! SKIING! Well it used to be — I haven’t been skiing since I had kids and I’m DYING to go with them!!! We love skiing and snowboarding! Spending time on the mountain together and watching the kids enjoy their time outside in the snow has been the best part. The kids definitely love coming in and having some hot chocolate in the lodge.